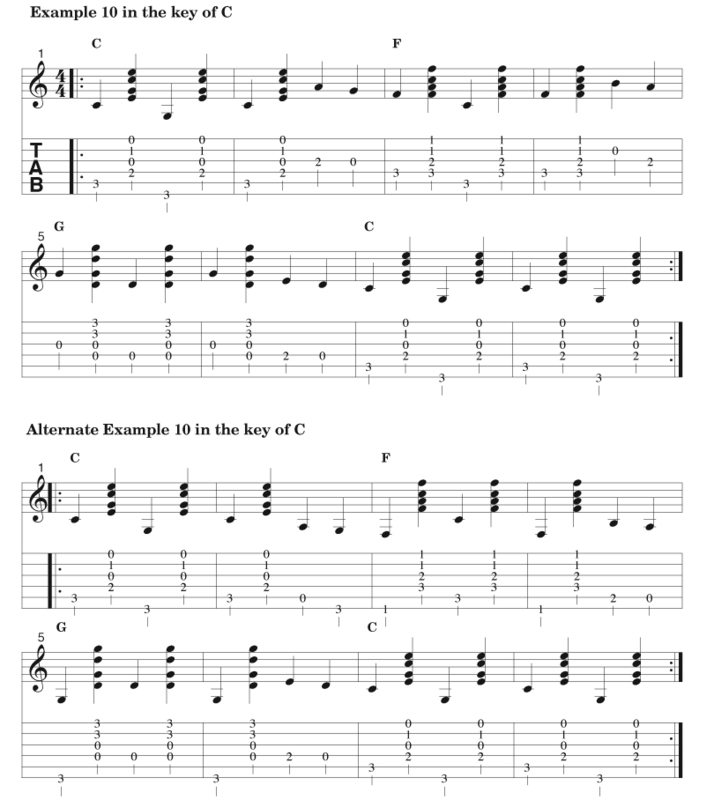 In each of the eight volumes of the Flatpicking Essentials Course readers are asked to work through the examples that are given in the books and then they are given suggested homework problems to work out. Each "homework" problem is designed reinforce the lessons taught through the examples given in the books so that each concept can be further explored and more experiential understanding can be gained. If you have any questions about the answers to the homework problems that I have listed here, please feel free to contact us (dan@flatpick.com). Please include "Flatpicking Essentials" in the subject line. 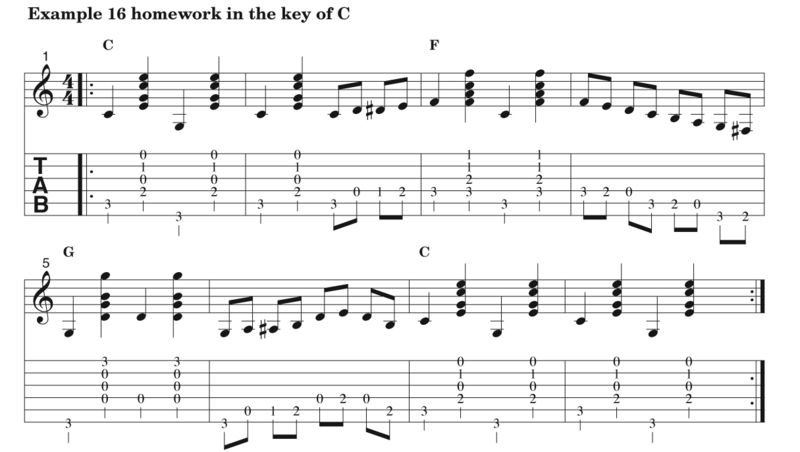 The assignment: After you have practiced Example 2 with the progression show (I-IV-V in the key of G), now work on playing the same I-IV-V progression in at least one other key. The key of C, or the key of D, perhaps. These are common keys in all styles of music. 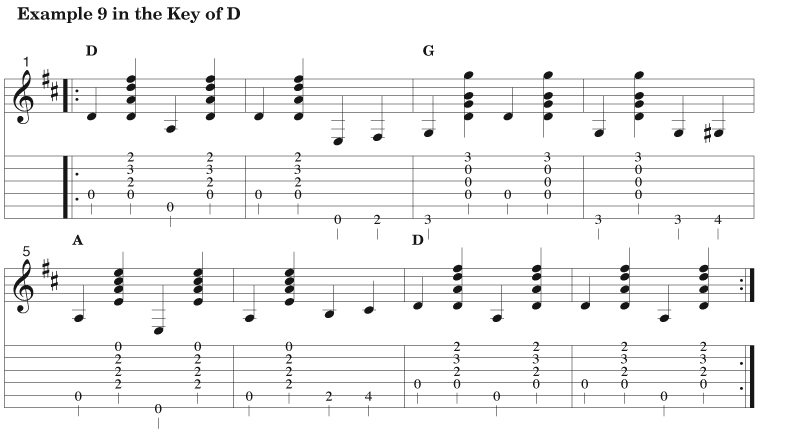 Remember that a I-IV-V progression in the key of C will use the chords C, F, and G. The I-IV-V progression in the key of D will use the D, G and A chords. 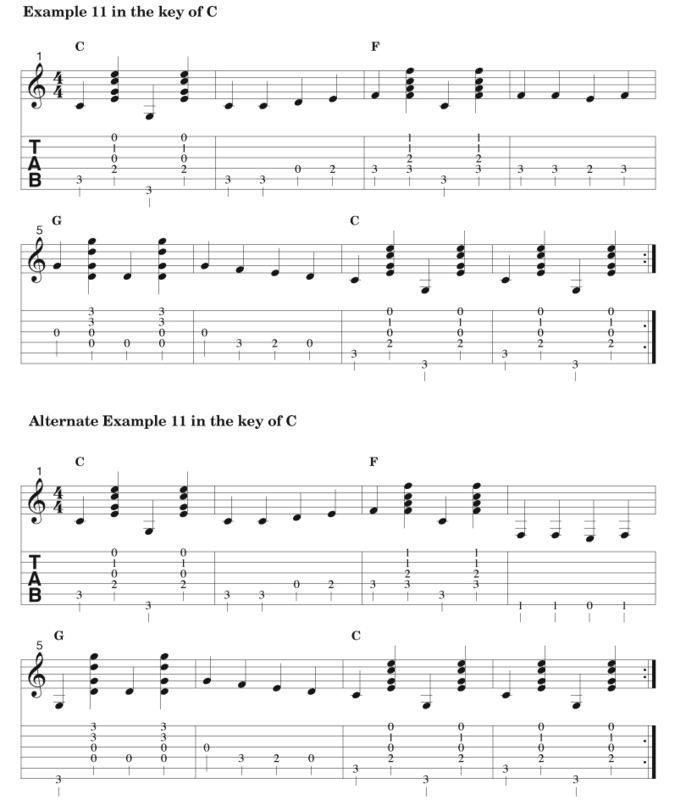 Try to play in the style of Example 2 in either or both of these keys. 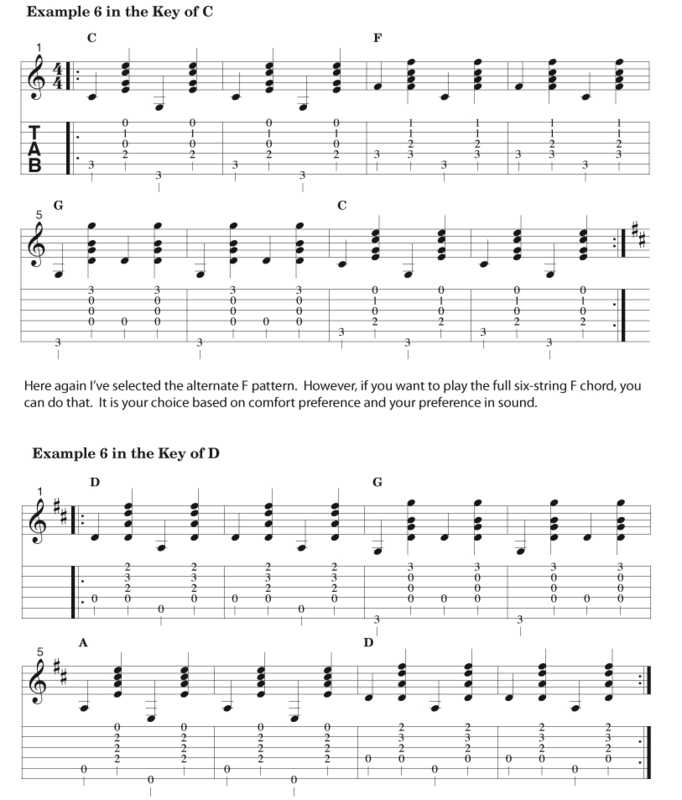 Click <here> for a transcribed answer to this problem in the keys of C and D.
The assignment: After you have practiced Examples 3, 4, and 5, try and experiment with the alternating bass line rhythm while holding other chords that you may know. 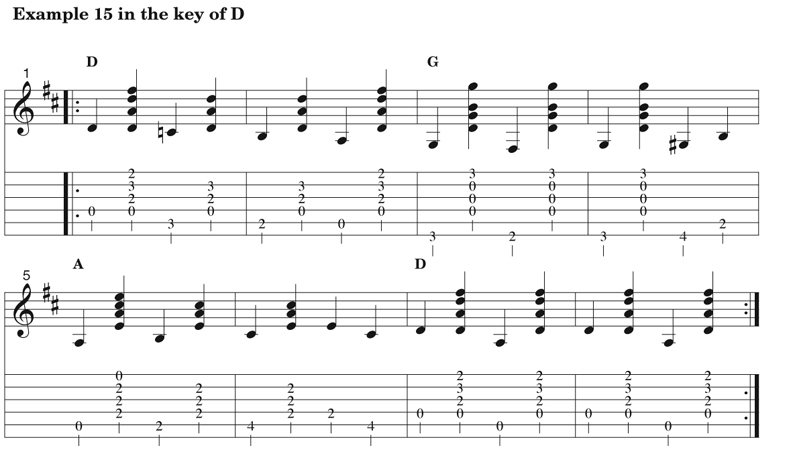 At a minimum, try this style of rhythm with the F-chord and the A-chord. 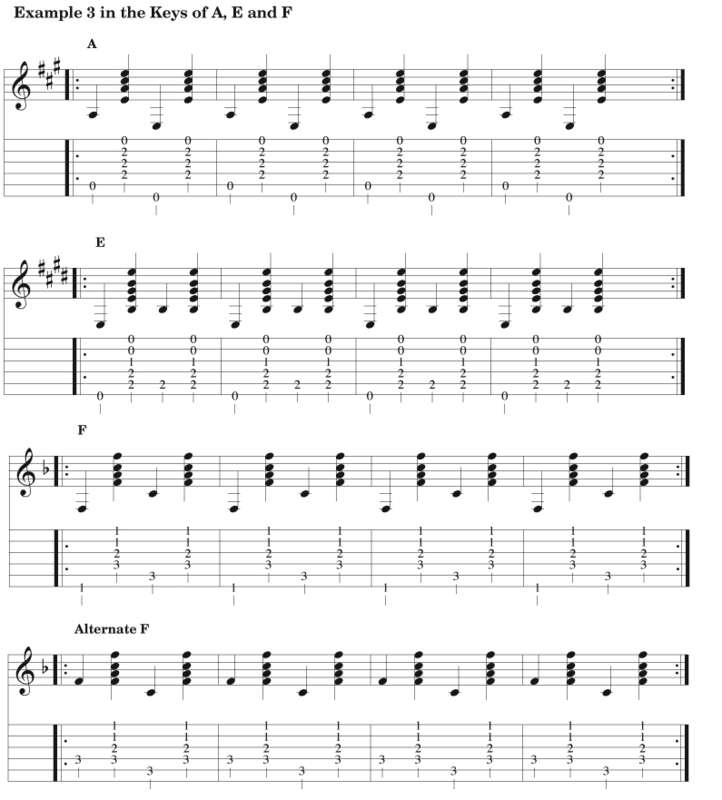 It may also help you a little later on if you try to also play an alternating bass rhythm with the E-chord. 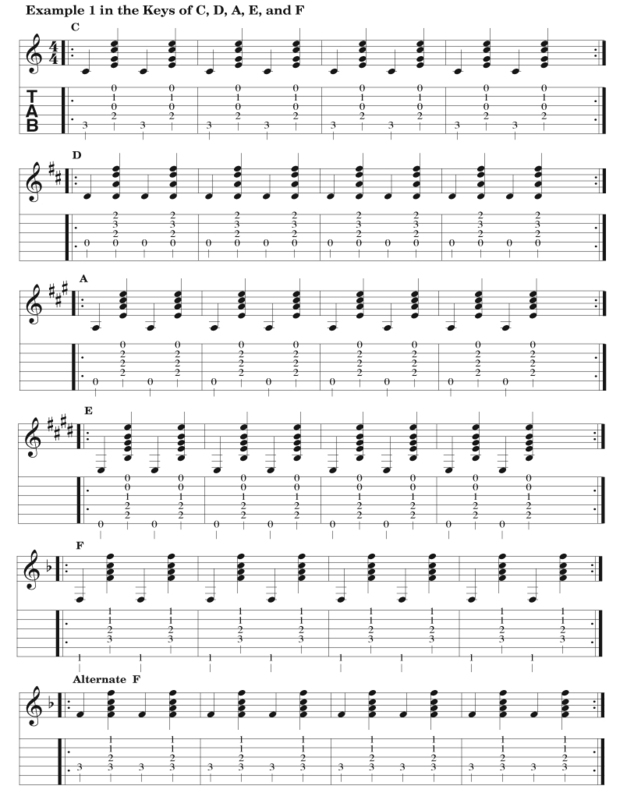 Click <here> to find the transcription for the alternating bass line with the E, A, and F chords. The assignment: After you have practiced Examples 6, try and experiment with the alternating bass line rhythm technique while playing a I-IV-V progression in a different key. 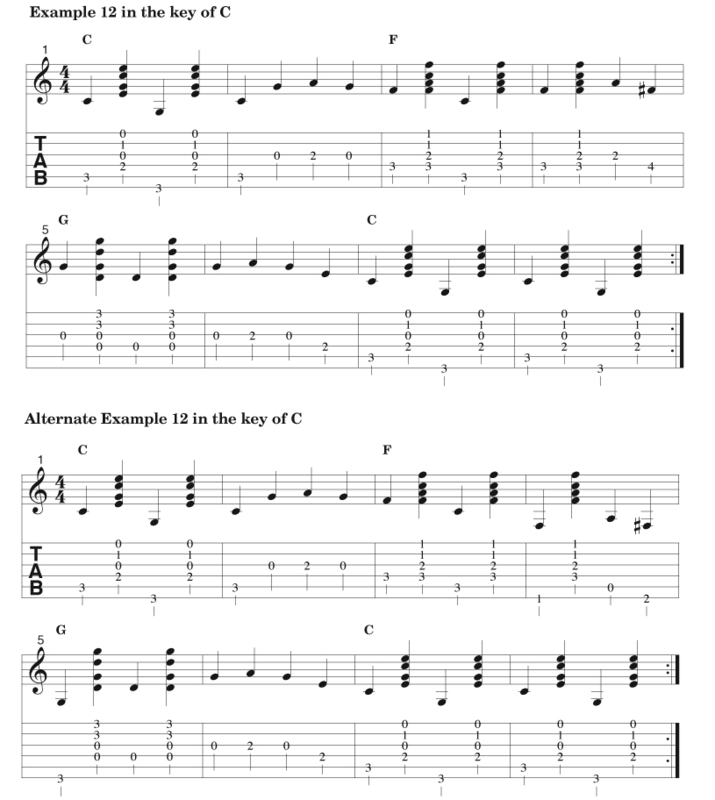 At a minimum, try this method in the keys of C and D. Click <here> for a transcribed answer to this problem in the keys of C and D.
The assignment: After you have practiced Example 8, and become familiar with how the leading tones sound, try to figure out the same style of progression, using leading tones, for a I, IV, V progression in the key of C and in the key of D. Click <here> for a transcribed answer to this problem in the key of C and <here> for a transcribed answer to this problem in the key of D.
The assignment: After you have practiced Example 9, and become familiar with how the leading tones sound, try to figure out the same style of progression, using similar scale walk up tones, for a I, IV, V progression in the key of C and in the key of D. Click <here> for a transcribed answer to this problem in the key of C and <here> for a transcribed answer to this problem in the key of D.
The assignment: After you have practiced Example 10, and become familiar with how the scale walk down tones sound, try to figure out the same style of progression, using similar scale walk up tones, for a I, IV, V progression in the key of C and in the key of D. Click <here> for a transcribed answer to this problem in the key of C and <here> for a transcribed answer to this problem in the key of D .
The assignment: After you have practiced Examples 11 and 12, and become familiar with their mechanics and their sound, try to play the exact same runs in other keys. Click <here> for a transcribed answer to Example 11 in the key of C and <here> for a transcribed answer to this Example 11 in the key of D. Click <here> for a transcribed answer to Example 12 in the key of C and <here> for a transcribed answer to this Example 12 in the key of D. I have included a variation in the key of D that uses lower strings. 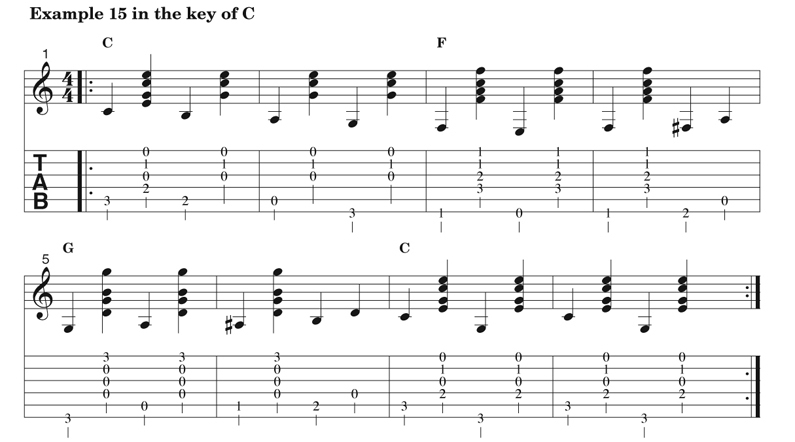 When using rhythm runs it sometimes sounds weak to play the unwound strings (B or high E strings). 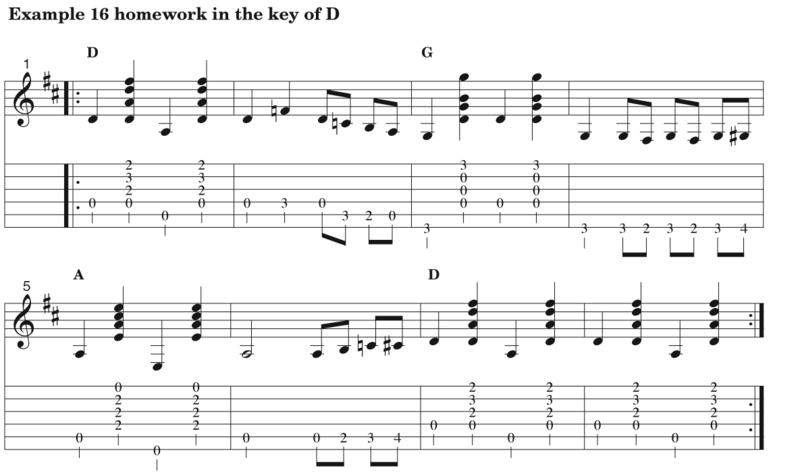 The variation in the key of D moves the example down to the bass strings. Slight adjustments were made to make it flow better. The assignment: For the time being, I’m not going to ask you to find this progression in other keys. Later, you will see an example of similar runs in the key of C, and I’ll point that out when it comes up. What I would like you to do here for homework is try to analyze what is going on here. Take a look at each run and figure out what notes are being used, what scales they are from, if they are walk-ups, or walk-downs, etc. When you analyze what is going on with runs, it helps you see what is happening, and it can also help inspire your own ideas. This is a really great bass run series that combines chromatic runs, walk-ups, and walk-downs. 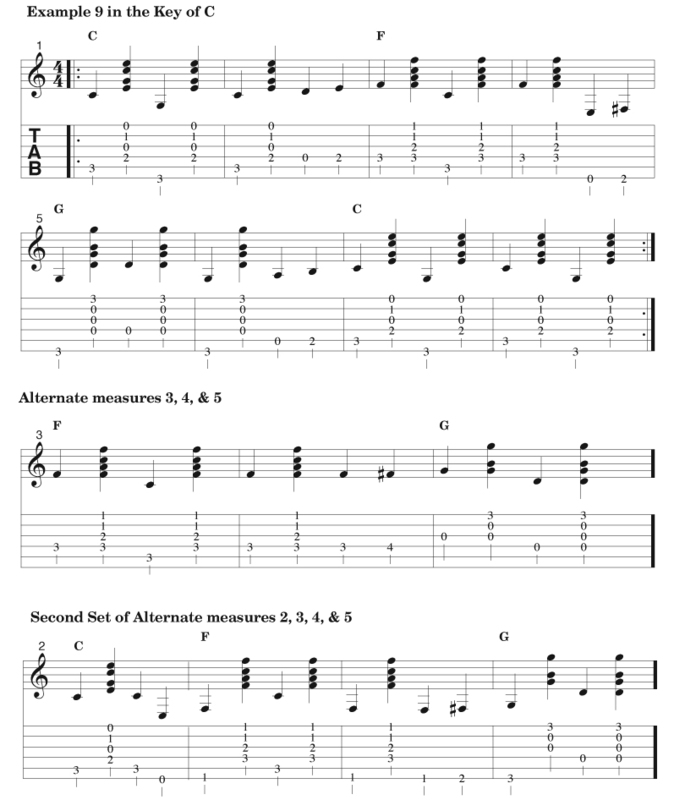 In measure 2 we walk up chromatically from the G chord to the C chord. In measure 3 we begin a chromatic walk up on the D string, but then reverse it mid stream to a chromatic walk down on the A string. 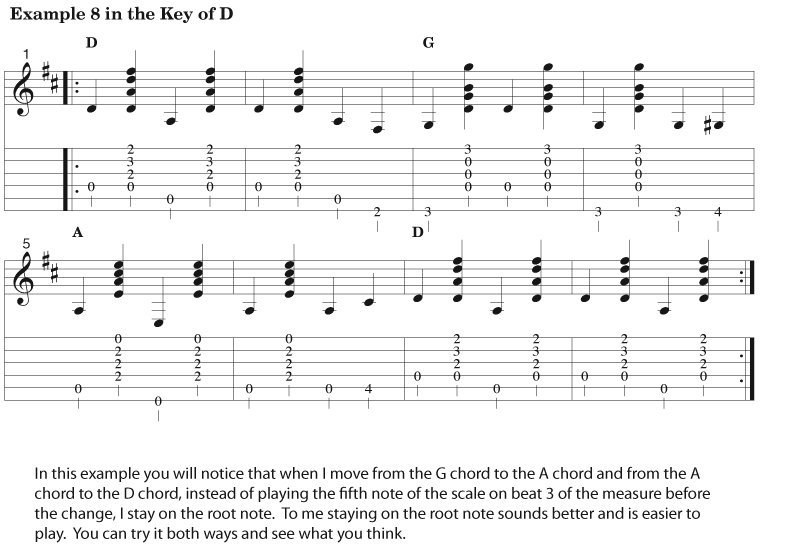 We end on the A note, which is the 5th note of the D chord, since we move to the root note of the D chord on the next beat, this works very well. 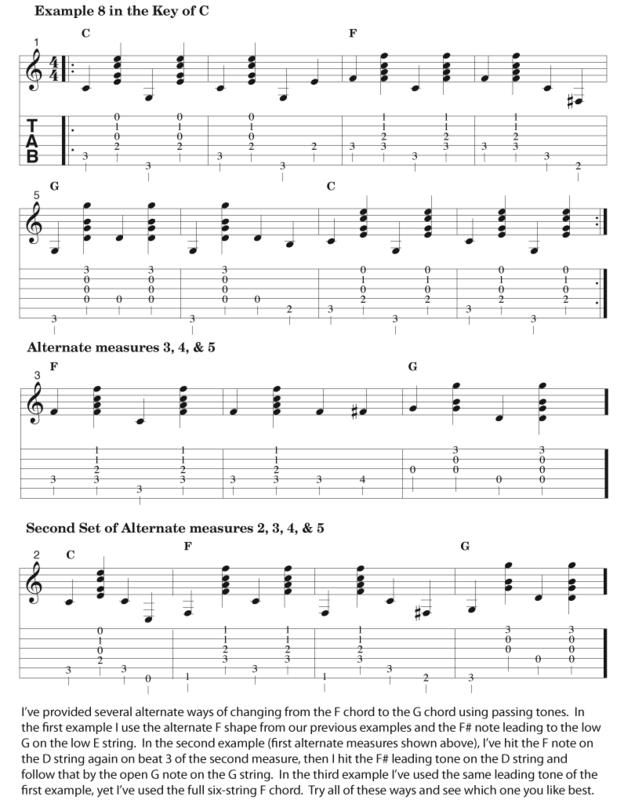 In measure 5 we begin a chromatic walk up on the D string, when we reach the F# note, we go back down to the D note and then walk back up along the D scale. Then in measure 7 we move from the G note on the open G string to the G note on the low E string using a G6 arpeggio. 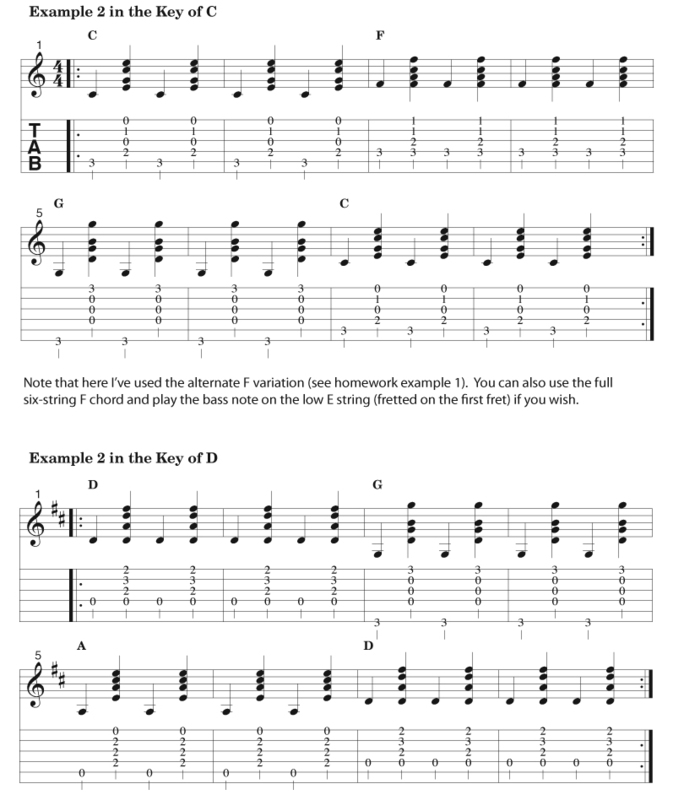 The assignment: The first thing to do for homework this time is to see if you can work out some half-note bass runs in the keys of C and D. Click <here>; for an arrangement in C and <here> for an arrangement in D.
The assignment: Like the homework assignment on the previous page, try to apply what you have learned here to other keys. 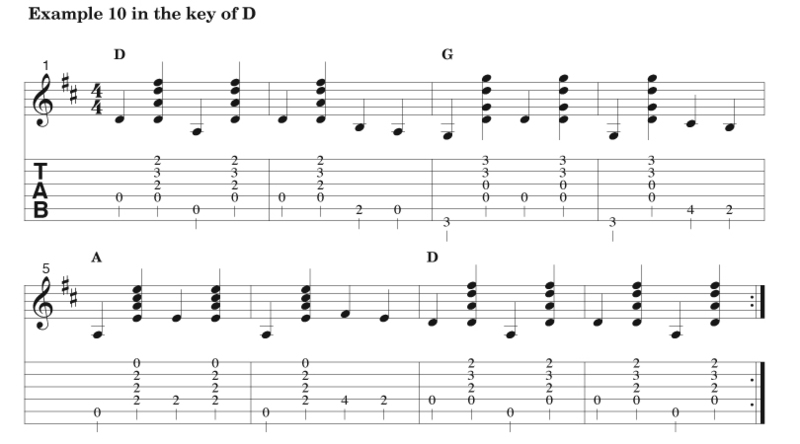 See if you can work out some eighth-note bass runs in the keys of C and D. After you do that, look back at some of the quarter note walk-ups and walk-downs that you have played previously and see if you can condense the runs and play them in the eighth-note style. 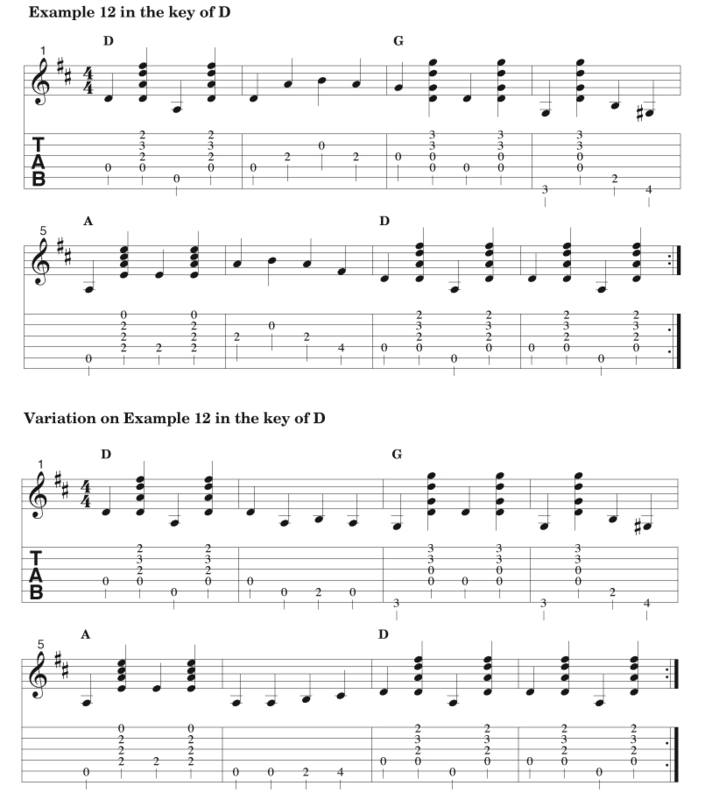 I have provided some other fill lick runs that you can use in the keys of C and D. I did not transcribe Example 16 exactly, because I wanted to throw some other ideas at you here. Click <here> for an arrangement in the key of C. Click <here> for an arrangement in the key of D.